Do not miss this exhibition! It is from the University of Pennsylvania Museum of Archaeology and Anthropology. The objects were found in 1940 in a cemetery in Panama circa A.D. 700-1100. The information about the gold objects and how they were made was very interesting. The gold ore was dug, smelted and then pounded into sheets of gold thin enough to be formed. 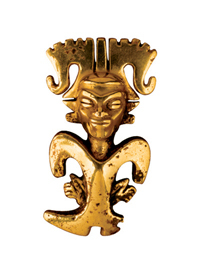 I had studied Precolumbian art in college and had taken a jewelry class. This exhibition gave me I a much better understand of the technology of the people and the skill of the artisans.